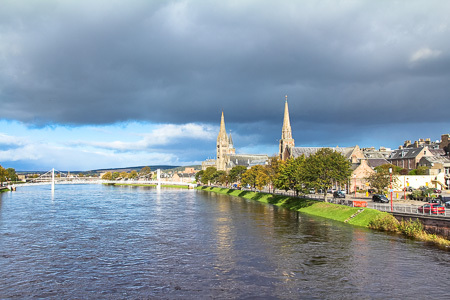 The City of Inverness is the administrative centre for the Highland council area, and is promoted as the capital of the Highlands of Scotland. The city lies near the site of the 18th century Battle of Culloden and at the northeastern extremity of the Great Glen, where the River Ness enters the Inverness/Moray Firth making it a natural hub for various transport links. Inverness is the northernmost city in the United Kingdom and, in comparison with the surrounding area, very busy. Inverness is also popular with tourists and offers many shops and restaurants in the town centre. The traditional city centre was a triangle bounded by High Street, Church Street and Academy Street. Between Union Street and Queensgate is the Victorian Market, which contains a large number of small shops and is particularly nice when the weather aint good, the Victorian Market is covered! Just outside the city centre at the Beauly Firth is the entrance to The Caledonian Canal. Inverness Castle sits on a cliff overlooking the River Ness, in Inverness, Scotland. The red sand stone structure evident today was built in 1836 by architect William Burn. It is built on the site of an 11th century defensive structure. Today, it houses Inverness Sheriff Court. There has been a castle at this site for many centuries. The castle itself is not open to the public but the grounds are. Loch Ness is probably the best-known Scottish loch, thanks to its famous resident, the monster of Loch Ness or Nessie. A circular trip around the Loch is the best way to explore the many interesting sites. When you start at Inverness in the morning it’s great to take the old military road, from Inverness to Fort Augustus, on the eastern shore of Loch Ness. You have the sun in your back and you can fully enjoy the stunning views over the loch. Halfway this military road is the village of Foyers which was once an important staging post on the old military road. The original inn at Foyers was first built in about 1655 when Cromwell’s troops had garrisons at Inverness and Inverlochy. General Wade, who built the first military roads and bridges linking Fort Augustus and Inverness around 1732 built himself a shelter called the “General’s Hut” and it has been stated that the building of The Foyers Hotel was on this site. Foyers was the first village in the Highlands to have electricity in each house powered by the British Aluminium Company and The Foyers Hotel was boldly advertised as “the only hotel to have electricity”. The military road ends at Fort Augustus which is situated at the south-western end of Loch Ness. The Caledonian Canal, which starts at Inverness and links the east and west coast of Scotland, runs through Fort Augustus and here you will find 5 locks. The Caledonian Canal Heritage Centre can be found in Fort Augustus too. Heading back to Inverness over the western bank of Loch Ness and on the much busier A82 you end up halfway at Strone where you an find one of the most popular, and one of the most beautiful, castle ruins of Scotland, Urquhart Castle. I can recommend a visit to the exhibition and audio-visual display in the new visitor centre before you take off to discover the castle grounds and commanding views over Loch Ness. Urquhart Castle is a must! Drumnadrochit is typically one of those places where people stop when they tour Loch Ness. It has a few cafe’s, a large Woollen Mill shop, nearby Urquhart Castle and the Loch Ness Monster Exhibition Centre at the Drumnadrochit hotel. This is a five star visitor attraction and you’ll find out why when you do the monster tour. It doesn’t give all the answers about Nessy but it does supply some very interesting facts. You won’t leave disappointed. From Drumnadrochit you can either head directly for Inverness or take a wee detour over the A833 where you ultimately end up in the beautiful village of Beauly, situated at the western tip of the Beauly Firth. This little town has an attractive town centre. 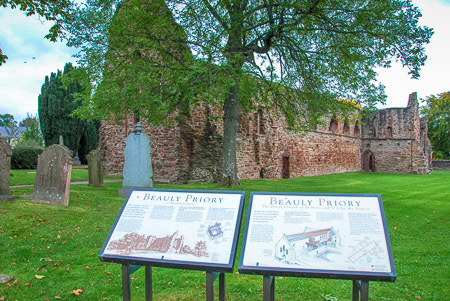 ‘C’est un beau lieu’, from the french what a beautiful place, was Mary Queen of Scots reaction to the grandeur of the scene when she stayed in Beauly in the 16th century, and local tradition credits the naming of the village to her. I can recommend a stop at The Lovat Arms, a beautiful traditional Highland hotel, before you continue your trip to find a beautiful abbey ruin on the northern edge of Beauly. Despite its name, the Black Isle is not an island, but a peninsula, surrounded on three sides by water – the Cromarty Firth to the north, the Beauly Firth to the south, and the Moray Firth to the east. On its fourth, western side, its boundary is delineated by rivers. The River Conon divides Maryburgh, a mile outside Dingwall, from Conon Bridge which is the first village on the Black Isle from the north-western side. Cromarty is the most northern village on the Black Isle and together with Fortrose, Chanonry Point, they share something unique. Both villages are an excellent base for viewing the local offshore sea life. Opposite Chanonry Point is one of the most beautiful forts in Europe, Fort George. Following the 1746 defeat at Culloden of Bonnie Prince Charlie, George II created the ultimate defence against further Jacobite unrest. The result, Fort George, is the mightiest artillery fortification in Britain, if not Europe. Its garrison buildings, artillery defences bristling with cannon, and superb collection of arms – including bayoneted muskets, pikes, swords and ammunition pouches – provide a fascinating insight into 18th century military life. Positioned strategically on a promontory jutting into the Moray Firth, Fort George was intended as an impregnable army base. Today the fort is an active military base and can be visited at the same time. The fort is open all year round and visiting Fort George is an unforgettable experience. Nairn is a former burgh in the Highland council area of Scotland. It is an ancient fishing port and market town around 16 miles east of Inverness. It was the county town of the wider county of Nairn also known as Nairnshire. This suprisingly lovely town is now best known as a seaside resort, with two golf courses, a small theatre and one small museum, providing information on the local area and incorporating the collection of the former Fishertown museum. Nairn is known as a world class golfing destination, with two 18 hole Championship golf courses. One of these, The Nairn Golf Club is one of the greatest traditional links courses in the world and was established in 1887. Nairn stages one of the biggest Highland games in the North. The first event was held in 1867, and it is now one of the few where entry remains free. The games are a major event in the local social calendar. Close to the beach where you have beautiful views over fishertown is a plaque with the following text: “In the past Nairn lived two lives. Artisans gathered together in the upper town, while down in Fishertown lived the many generation who worked the sea. This was a tight knit community. The houses, built side-by-side, turned their backs on both sea and the outside world. Salt houses, smoking sheds and the barking house were squeezed in between the homes. Fishing was a relentless business for the folk of Fishertown. Men and boys went to sea. Woman prepared the lines, mended nets, smoked the fish and sold then in the town and surrounding country. The are took it’s present form when Telford’s harbour was built in 1820. The fear of flooding had limited its growth previously, but with this ear removed, Fishertown grew rapidly as many people from the outlyinig fishing villages came to be near the harbour. 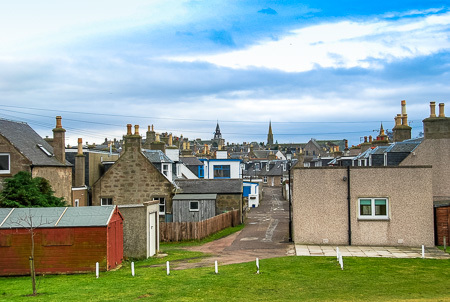 Besides the call of the seagulls, there are many echoes of the past to be found in and around Fishertown, in the old architecture, the Seamen’s Victoria Hal (built in 1887) and among the fine displays at Nairn Museum.